Neuroscience is the study of the nervous system, which includes the brain, spinal cord, and nerves. The brain controls every aspect of the body, from emotion and memory to basic bodily activities such as movement, breathing, and controlling the heartbeat. Neuroscience is largely about the study of behavior—why do we do what we do, and how does the brain carry out these tasks? It is also concerned with the causes and treatment of nervous system disorders. Since the dawn of human consciousness, people have been interested in understanding the basis for human behavior. The ancient Greek philosopher Aristotle believed that all the functions that we now know to have a basis in the brain—such as memory, emotions, and consciousness—were carried out by the heart. Ancient Egyptians also believed that the heart was the source of consciousness. In Ancient Egyptian culture, when the bodies of deceased individuals were preserved as mummies, the brain was regarded as a useless part of the body, and it was often removed (through the nose!) and discarded. However, eventually Egyptians did recognize that the brain was responsible for certain bodily functions. The Edwin Smith papyrus, from about 1700 B.C., is the earliest medical text on record and includes medical cases of patients with damage to the brain and spinal cord. The author of the ancient papyrus knew that the brain controlled movement, so at some point the ancient Egyptians did understand some of the functions of the brain. But they did not know how to treat brain damage that led to impaired movement. The Roman physician Galen, who lived in the 2nd Century B.C., believed that a person’s bodily functions and temperament were controlled by the brain. He also studied the spinal cord and concluded that it was an extension of the brain, and that it controlled motor movements of the body by transmitting signals from the brain. His theories influenced medical thinking tremendously. In fact, for a long period of time, they became central dogma, and were not much expanded upon until the 17th Century by scientists like Rene Descartes, who was the first to study reflex action. Descartes also postulated that the mind is separate from the brain; although this idea is still around today, most neuroscientists believe that the brain and mind are not separate, and that the mind arises directly from biological processes in the brain. Also in the 17th Century, Thomas Willis published the book Anatomy of the Brain, which discussed reflexes, epilepsy, and paralysis. This book contained the first use of the word neurology (the study of nervous system disorders). Further advances were made in the last several hundred years. Neurons were discovered and nerves were hypothesized to operate through electricity. Neurosurgery began to be performed, and neuroscience research journals were established. 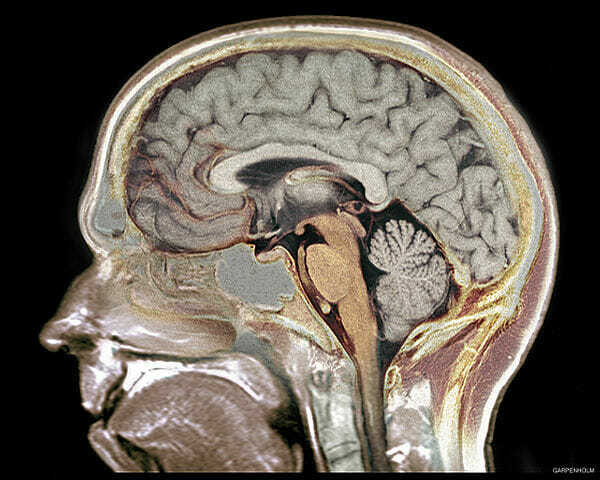 In the 20th Century, techniques like magnetic resonance imaging (MRI), nuclear magnetic resonance (NMR) scanning, and positron emission tomography (PET) scanning were developed, which allowed scientists to image activity in the brain. Neuroscience became a booming field in the early 1990s, when functional magnetic resonance imaging (fMRI) was used to map brain activity through detecting changes in the brain’s blood flow. This image was obtained through an MRI scan. Affective neuroscience is the study of how the nervous system affects emotions. Behavioral neuroscience is the study of the biological basis of behavior and how the brain affects behavior. It involves the study of humans and animals and has also contributed to our understanding of conditions such as Alzheimer’s disease, clinical depression, and schizophrenia. Clinical neuroscience deals with nervous system disorders such as epilepsy or nervous system injuries. In clinical neuroscience, neurologists and psychiatrists use the latest research findings to explore how to treat and rehabilitate patients. Cognitive neuroscience studies higher cognitive functions in humans, such as memory, problem solving, and the use of language to communicate. Computational neuroscience involves the use of computers to model brain functioning. It involves overlap from fields such as mathematics and physics. Developmental neuroscience is the study of the mechanisms of neuronal development at the cellular level. It involves how the brain grows and changes during development. Molecular and cellular neuroscience looks at how neurons function at the molecular and cellular levels. It involves the study of the anatomy and physiology of neurons, along with specific genes and proteins that are necessary for neuronal functioning. Neuroscientists work in laboratory and clinical settings. Many of these positions require education beyond a bachelor’s degree. To design research experiments and become the head of a laboratory, one must obtain a PhD in Neuroscience. Some laboratories are located at hospitals, while many others are located at universities. Other neuroscientists have a medical degree. A neuroscientist with an MD could become a neurologist or a neurological surgeon. There are also jobs related to neuroscience at the master’s degree or bachelor’s degree levels. An individual with a master’s degree could become a lab manager, physician’s assistant, or neuroimaging technician, while an individual with a bachelor’s degree could be a lab technician or, with some specialized training, a medical technician, patient care assistant, pharmacy technician, or EEG technologist. Although some people obtain a bachelor’s degree in Biology and then pursue higher education specifically in neuroscience, there is also specifically a neuroscience major for undergraduates at certain universities. A neuroscience major usually must take classes in biology and statistics, along with calculus, chemistry, and physics. Since neuroscience is interdisciplinary, a variety of other courses may be taken, such as ones in psychology, computer science, and molecular biology. Neuroscience majors often complete an independent research project during their senior year. n.a. (n.d.). “About Neuroscience.” Society for Neuroscience. Retrieved 2017-04-29 from https://www.sfn.org/about/about-neuroscience. n.a. (n.d.) “Careers in Neuroscience.” The Ohio State University. Retrieved 2017-04-29 from https://neurosciencemajor.osu.edu/careers-neuroscience. n.a. (n.d.) “Neuroscience.” Atlantic International University. Retrieved 2017-04-29 from http://courses.aiu.edu/NEUROSCIENCE/NEUROSCIENCE%20-%20SESSION%208/NEUROSCIENCE%20-%20SESSION%208.pdf. n.a. (n.d.) “Neuroscience Major.” University of California, Los Angeles. Retrieved 2017-04-29 from http://www.neurosci.ucla.edu/neuroscience-major.html. n.a. (n.d.) “What are the different areas of neuroscience?” National Institutes of Health. Retrieved 2017-04-29 from https://www.nichd.nih.gov/health/topics/neuro/conditioninfo/Pages/areas.aspx. n.a. (2017-04-17). “Major in Neuroscience.” Dartmouth College. Retrieved 2017-04-29 from http://pbs.dartmouth.edu/undergraduate/neuroscience/major-neuroscience. Gross, Charles C. (1987). “Neuroscience, Early History of.” Encyclopedia of Neuroscience. G. Adelman (Ed.). Basel, Switzerland: Birkhӓuser. Retrieved 2017-04-29 from http://www.princeton.edu/~cggross/Hist_Neurosci_Ency_neurosci.pdf. Hunter, Andy. (2009-07-15). “A (Very) Brief History of Neuroscience.” Brain World. Retrieved 2017-04-29 from http://brainworldmagazine.com/a-very-brief-history-of-neuroscience/. Kilgard, Michael P. (n.d.) “Neuroscience Careers.” The University of Texas at Dallas. Retrieved 2017-04-29 from https://www.utdallas.edu/~kilgard/neuroscience_careers.htm.